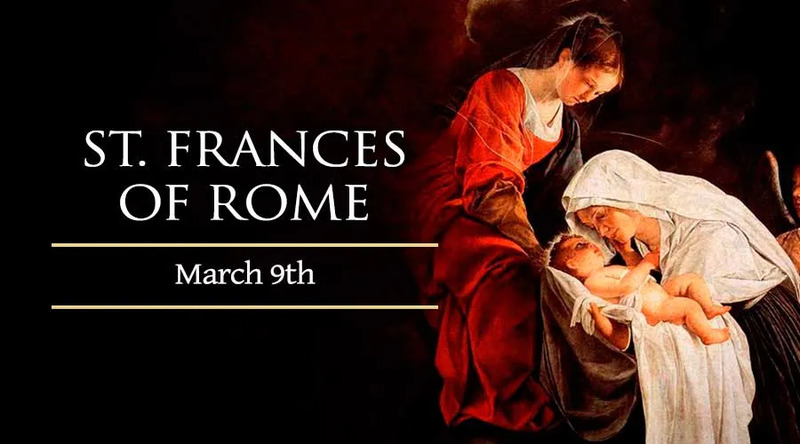 St. Frances was born into a noble Roman family in the year 1384. From an early age, Frances felt drawn to the religious life, but at the age of thirteen her parents forced her into marriage. As Frances became acquainted with her in-laws she found that the wife of her brother-in-law felt the same calling to the religious life that she did. From this point on, the two women began to work to help the poor. Frances did not allow her charitable work to interfere with her family life, and bore three children. After the plague swept through Rome and left one of Frances' children dead, she began to turn again to charitable work. Frances gave up all her wealth to the sick and poor and began to go door to door raising money to aid the sick and poor. After the plague claimed Frances' daughter, she opened up a wing of her home as a hospital for the poor. As Frances became more deeply involved in charitable work, she began to realize the great need for it in the world and began to seek permission from the pope to form a charitable society of women to do this work. The women followed the ideals of the Benedictine order and carried on active charity and assistance of the poor. After setting up the foundation of this society, Frances continued to live with her husband until his death. After his death Frances lived the remainder of her life with the society that she formed. Frances died in 1440 and is the patron of widows and motorists.